Wilkins is most well-known for beginning the X-ray diffraction images of DNA that contributed to Watson and Crick's discovery of the double-helix structure of DNA. 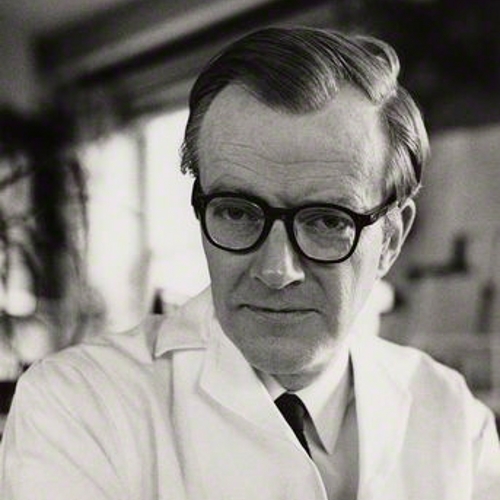 Maurice Wilkins was born to Irish parents. At the time of his birth his father, Edgar Wilkins, was a medical doctor working for the School Medical Service and his mother, Eveline Whittack, was a school teacher, in an isolated part of New Zealand. The family then moved to Wellington where Wilkins spent his early childhood. Wilkins later described his time in New Zealand as some of the happiest years of his life, affording the possibilities of exploration and discovery. When Wilkins was 6 years old the family moved to Birmingham, England, so that his father could further his studies into preventive medicine. Much of the work his father did helped advance treatments for children living in the poverty-stricken areas of the city. Once in Birmingham, Wilkins turned his hand to building his own telescopes and microscopes to pursue his interest in astronomy and optics. In the early 1940s Wilkins married Ruth, an art student whom he met during his time in Berkley, California. He divorced her shortly after the birth of their son. In 1959 Wilkins married Patricia Ann Chidgey, a teacher, with whom he had four children. Wilkins' early school years were spent at Wylde Green College and then King Edward's School. In 1935 Wilkins went to St John's College, Cambridge to study physics, which he pursued while taking an active part in university politics. While at Cambridge Wilkins was tutored by Mark Oliphant, who, impressed by Wilkin's ability and interest in thermoluminescence and phosphorecence, arranged for him to become a doctoral student under John Randall at Birmingham University. Wilkins completed his PhD in 1940. His doctoral research focused on the thermal stability of trapped electrons in phosphors and on the theory of phosphorescence. After completing his doctorate, Wilkins was recruited to the Ministry of Home Security and Aircraft production, where he deployed his skills for improving cathode-ray tube screens for radar. Wilkins then moved on to working with Oliphant on the mass spectrograph separation of uranium isotope for use in bombs. Following this, Wilkins moved with Oliphant to Berkley, California, to work on the Manhattan Project, helping in the development of the nuclear bomb. Horrified by the effects of the bomb in Nagasaki and Hiroshima, Wilkins resolved after the War to move into another branch of science that had more positive applications. In 1945 he returned to Britain to join Randall at St Andrew's University in Scotland, where he was appointed assistant lecturer. Wilkins moved with Randall to King's College in 1946, becoming his assistant director for the newly formed Biophysics Unit. It was here that Wilkins began his research into the development of X-ray crystallography for biological research. In 1950 Wilkins started focusing his research on DNA. This was to lay the foundation for determining the structure of DNA in 1953. In 1962 Wilkins was awarded the Nobel Prize with Francis Crick and James Watson for his contribution to the elucidation of the structure of DNA. Wilkins had been involved in the formative x-ray diffraction work on DNA and was responsible for showing the first crystalline symmetrical patterns of DNA. This work inspired James Watson to see the possibilities of studying the structure of DNA in 1951. Wilkins was also responsible for alerting Watson and Crick to the key x-ray diffraction photograph taken by Rosalind Franklin which helped in their building of the model of the double-helix of DNA that they published in 1953. He was also instrumental in the painstaking process necessary for checking the validity of the model proposed by Watson and Crick. In addition to his scientific research, Wilkins took the lead in getting scientists to explore the social responsibilities of scientists and was elected the first President of the British Society for Social Responsibility in Science. The society has played a pivotal role in debating issues such as the potential use of genetics in biological warfare and helping to promote a wider public understanding of science.